Due to capacity constraints within Chester-le-Street Depot, the operation of all of the depot's minibus contracts are transferring elsewhere. The operation of the Durham Cathedral Bus services 40/40A/40B has transferred from Chester-le-Street Depot to Stanley and as such this vehicle has transferred similarly to operate these services. 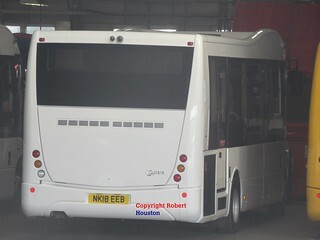 Presently unbranded; this vehicle has entered service at Chester-le-Street Depot, on Cathedral Bus services 40/40A/40B. 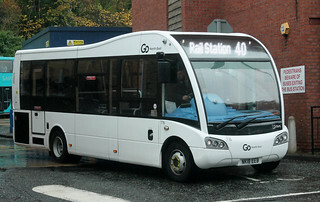 This vehicle, which carries a plain white base livery, has arrived into the Go North East fleet. It is currently being prepared for service at Saltmeadows Road Depot. It will be transferred to Chester-le-Street Depot in due course. These brand new buses feature Esteban Civic V3 seating albeit with blue ‘Go’ fabric seat moquette opposed to the now-standard leather; two-colour Tarabus 'Wood Effect' flooring; and blue accent lighting, which is fitted underneath seats, to provide extra light on the gangway. 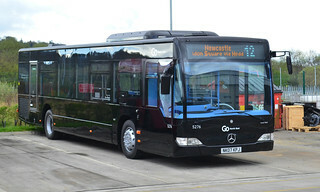 They are also fitted with free passenger Wi-Fi, but not Next Stop Announcements as is now considered to be the standard specification of Go North East’s new vehicles. The discrepancies in the specification of these vehicles compared to the standard specification relates to the fact that they have been purchased for specific low-cost Durham County Council contracts. This vehicle has returned to Go North East following internal refurbishment and repaint into a plain black base livery. It is currently undergoing preparation for service at Saltmeadows Road Depot prior to allocation to Riverside Depot. Prior to the service changes taking place on Sunday 17th April 2016, this vehicle has transferred from Riverside Depot to Stanley, allowing a period of driver familiarisation on the Volvo B9TL vehicle type.